With the holidays around the corner, many people are experiencing a combination of excitement and nostalgia for the festive season along with the sting of unresolved or unexpressed challenges with people we love. For some, this can lead to a sense of anxiety or dysphoria as the holidays approach due to feeling stuck and uncertain about how to proceed. Saying or hearing the words, “We need to talk,” often provokes feelings of uneasiness, mainly because these words acknowledge the elephant in the room: Something is unresolved and needs to be addressed, and because it is unresolved it remains uncertain. Uncertainty is an emotional state we as humans are not huge fans of, so our natural inclination might be to respond with pre-emptive defensiveness or the belief that we are right in an effort to create certainty and stability, and perhaps also preserve our egos. Add to this the fact that we all have beliefs about conflict and confrontation that were shaped by our past experiences and cultural backgrounds, so for many people these words might also elicit feelings of fear, dread, and perhaps the tendency to avoid conflict in order to keep the peace. But what if speaking or hearing these words could be reframed as a need for connection, closeness, and deeper understanding? Oftentimes we need to share our perspective, clear the air, or let someone know how we feel in order to engage in our relationships with greater authenticity and richness, and having difficult conversations – whether we are the confronter or the one being confronted – is a crucial element to relational depth. What is the purpose or goal of this conversation? What is my ideal outcome? What are my wants and needs? What am I feeling about this situation as a whole? What part of the conflict or issue am I responsible for? Is there anything from my past being triggered by the current issue? If so, what? What assumptions do I have about the other person’s intentions or perspective? What might they be thinking and feeling? How am I feeling about having this conversation? How might the other person be feeling? Practice techniques for self-soothing and centering ahead of time, that way they can be leveraged in the moment when you need them the most. If you’re feeling nervous about approaching the conversation or find yourself playing it out in your head, that’s a great time to practice mindfulness, deep breathing, or grounding techniques, which allow you to acknowledge your emotions and return to the present moment. It’s also important to consider the physical space you’re in when approaching difficult or sensitive topics. Whenever possible, try to schedule your conversation for a quiet space that is relatively private to reduce any environmental distractions. If finding time and space is difficult, try not to become discouraged. For things that are important to address, finding the right time and space can be worth the wait. That said, there is no “perfect” time or situation that will guarantee the other person will have a positive reception to the conversation. Approach the other person with curiosity, openness, and a collaborative mindset. Be clear and use specific examples while avoiding blaming or using accusatory language. State what you notice and try not to use absolutes like “always” and “never” as you give examples. If you become nervous, practice self-soothing and centering. Elicit the other person’s perspective and listen without interrupting. Redirect the conversation if starts to go off the rails. “I think we might be getting into the weeds here and would like to refocus on the issue at hand.” Center yourself and breathe. Again, use your self-soothing and centering techniques as needed. Again, listen to their ideas openly and without interrupting. When sharing your ideas, use collaborative language whenever possible (e.g., “we/us” instead of “you/me”). Recap what you’ve discussed, including solutions you’ve come to and areas where you may have agreed to disagree. For especially difficult topics or if a conversation did not go as you hoped, it will be important to enlist the help of your support system. Reach out and debrief with a trusted friend or your partner. Again, practice self-care strategies and give yourself time and space to tend for yourself as you process and integrate this experience. Sometimes people approach us with difficult topics and we find ourselves having negative reactions to being confronted. We may become nervous, defensive, or rigid in our thought process, and may sometimes find ourselves triggered by past challenges. If you hear the words, “We need to talk,” the very same strategies described above can be leveraged to remain receptive, calm, and self-aware when someone else raises a concern. If you find yourself struggling to approach someone in your life about an issue that’s important to you, or having difficulty when approached by someone else, counseling can help you dig deeper into the experiences that have shaped your attitudes about conflict and assertiveness, learn skills for self-soothing, and strategize a healthy path forward. Fill out our contact form or call us at 773-512-4992 to find out how the therapists at Bergen Counseling Center can help you prepare to have difficult conversations with your loved ones. Imagine—it’s Monday morning, and you wake up to the harsh sound of your alarm clock before reluctantly rolling out of bed. You make breakfast, grab some coffee, and then commute to work, which, in this case, happens to mean walking to your computer 10 feet away. The benefits of working from home are obvious—you can sleep in later by shortening your commute, and thus allot more time to be productive. Plus, who wouldn’t want to work in their pajamas? So what happens when our work context becomes the same as our day-to-day context? What happens when instead of working at our desk, we work at the breakfast table, or in bed, or on the couch? Our brain receives multiple other signals which cue a variety of behaviors that are not work related, which can seriously impede our productivity or our ability to get into the work that we’re doing. 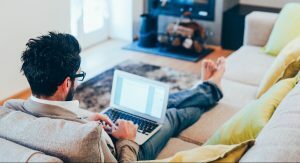 To this end, those consistently working from home should try to set aside a specific space that is specifically designated for work. This should be a space where work-related behaviors occur, and other behaviors are limited—a cup of coffee is fine, but avoid eating your lunch or chatting on the phone there when possible. This will help ensure that you establish new rituals, and, in turn, allows your brain to associate this new context specifically with work. In the same way that entering work provides us with an important change of context, leaving work cues our brain to shift gears and let go of the work day in order to return home. Working from home, however, blurs this boundary in such a way that many who work from home report feeling as though they’re “always on.” This is difficult not only for the person working from home, but for others in the home as well—especially kids. Children may not understand why their mom is at home, but not as easily available to play. This blurred boundary becomes confusing, and can lead to conflict when expectations are violated. Additionally, the person working from home may feel compelled to continue working after the work day is actually over. Without physically leaving the work space, it can be difficult to psychologically “leave” work; we may tell ourselves “well, I’ll just finish this one project,” or “If this conference call runs long this time, it’s ok—I’m already at home.” And indeed, sometimes we may find ourselves staying late at work in the same way we may get “stuck” at the office from time to time. However, we should be careful about the message that this sends to our other coworkers, our supervisors, and ourselves. Just because we work from home, doesn’t mean that our home should always be a workplace. It is critical to retain a separation in order to maintain a good work/life balance. 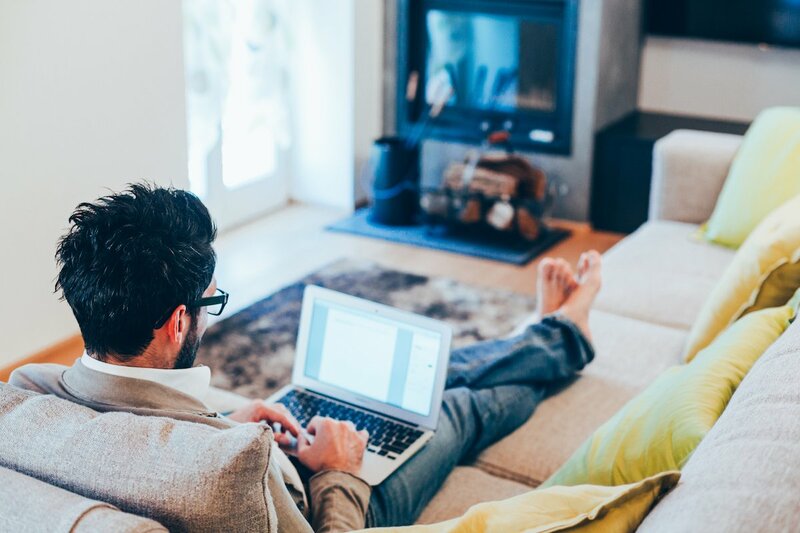 An additional challenge that comes with working from home or telecommuting is that the day-to-day can quickly begin to feel lonely. Making friends within the context of a shared office space helps keep camaraderie high, and can provide a sense of support during particularly challenging times at work. Humans are social creatures, and the everyday interactions with familiar faces creates a distinctly different work environment that one in which we are alone at home for the majority of the day. Beyond this, creativity and capacity for collaboration is jeopardized when you work alone; opportunities for brainstorming or informally bouncing ideas off of each other decrease significantly, and must be specifically sought out when needed. To this end, those who work from home should be intentional about continuing to cultivate working relationships with their coworkers. “Out of sight, out of mind” should not be the rule of thumb for telecommuters; rather, those working from home may find benefits from using video chat to remain included in meetings, or choosing phone calls over emails when communicating with coworkers. Additionally, extra energy may need to be put toward maintaining social relationships—both in and out of work. Making plans with coworkers or other friends to connect outside of work can disrupt the monotony that can easily begin to creep in if we aren’t careful. The areas of concern above bring added challenges to things that are already challenging for many—work/life balance, conflict, negotiating expectations at work and at home, setting boundaries with coworkers and supervisors, mitigating the effects of isolation, maintaining social relationships, and generally striving toward a life that feels satisfying, rewarding, and balanced. The extra stress in these areas may not individually be enough to strongly impact your mental health, but together their effects may feel more prominent. It’s important to continue to check in with yourself from time to time to ensure that you’re living the life you want to live.